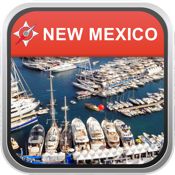 New Mexico, USA City Navigator Maps app is just a perfect map for you. III. The last but not least - This map of New Mexico, USA is ready to go: just install and this map is always with you whether you have carrier connection or not.